Born in Albosaggia Sondrio, Italy on 13th September 1930. Passed away 28th March, aged 88 years. Beloved Husband of Margaret (dec). Father of Peter, Linda and Melissa. Nonno of Joselyn, Justin, Danielle, Taryn, Stephanie, Brayden, Paige and Keeley. Biz Nonno of Kobe, Kaiden, Jack, Campbell, Blair, Jai (dec), Annabel, Quinn and Madison. Reunited with Margaret. 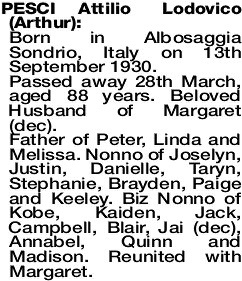 The Funeral Service to celebrate the life of the late Mr Attilio Lodovico 'Arthur' Pesci of Collie will be held at the Collie Italian Club, Ewing Street, Collie commencing at 11:00am on FRIDAY (05.04.2019). Following the Service the cortege will then proceed to the COLLIE Cemetery for Burial at 12:00pm. Deepest sympathy to Peter, Linda, Melissa and families. 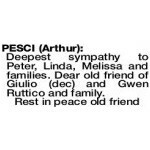 Dear old friend of Giulio (dec) and Gwen Ruttico and family.